Danial Tahayneh, born from a sperm smuggled from prison. JENIN, August 25, 2018 (WAFA) – Wife of Palestinian prisoner in Israeli jails, Mohammad Mutaib Tahayneh, from Silat al-Harthiyeh village, west of the northern West Bank city of Jenin, gave birth on Saturday after she had conceived from sperm from her imprisoned husband smuggled from the prison, according to Tahayneh’s family. Tahayneh’s wife, Rasha, has undergone an IVF treatment at a fertility center in the occupied West Bank and the procedure was a success. She delivered a healthy baby boy at the Specialized Arab Hospital in Nablus, said the family. The boy was named Danial. Tahayneh is serving 19 years in Israeli jails and has spent 16 years of his sentence. Several Palestinian prisoners in Israeli jails have resorted to smuggling of sperm out of prisons in order to become father. Wives of the prisoners gained support for the procedure after the Palestinian Authority’s religious council decreed the IVF treatment permissible for the wives of prisoners. RAMALLAH, August 25, 2018 (WAFA) – The Palestine Football Association (PFA) Saturday accused the world football association, FIFA, of colluding with Israel and right wing Israeli groups in its decision to ban its head, Jibril Rajoub, from attending FIFA games for one year for allegedly inciting to hatred and violence against Argentinian player Lionel Messi. Palestinians had strongly opposed holding a pre-World Cup friendly match between Argentina and Israel in Jerusalem. The match was originally scheduled to be held in Haifa, northern Israel, but Palestinians accused Israel of using the game for political ends by moving it to occupied Jerusalem. The game was eventually cancelled after the Argentinean team said it will not play in Israel. “The 12-month match suspension imposed on Mr Rajoub entails a ban on taking part in any future match or competition taking place during the given period. Consequently, Mr Rajoub will not be able to attend football matches or competitions in any official capacity, which includes, among others, participating in media activities at stadiums or in their vicinity on match days,” said the FIFA committee. The 12-month match suspension became effective on Friday. The PFA said the Disciplinary Committee’s decision was based “on the allegations of interest groups,” one of which is the Israeli Football Association, which is in legal conflict with the PFA before FIFA, “and another representing an extremist settler group that resides illegally in the Palestinian occupied territories” that based its accusations on media statements by Rajoub to Lebanese media in 2013. “With regard to the alleged threats to Lionel Messi, we question the legality of a third party acting on behalf of Messi who did not file a complaint himself, neither did the Argentinian football Association,” said the PFA. 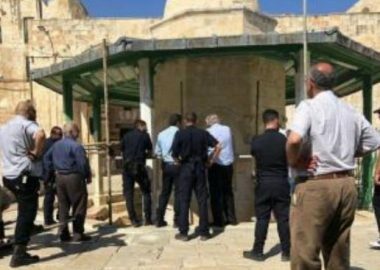 The Israeli occupation police on Saturday closed Bab al-Asbat area in the Old City of Jerusalem after a suspicious object was allegedly spotted there. 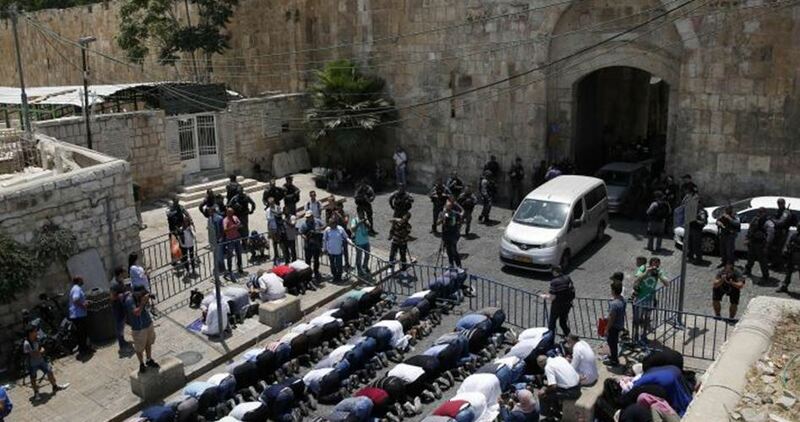 A local journalist told Quds Press that Israeli police forces blocked all roads leading to Bab al-Asbat after finding that object. He added that all Palestinian citizens and tourists were prevented from going to the area as special technicians from the police were examining the item, which turned out to be a toy. 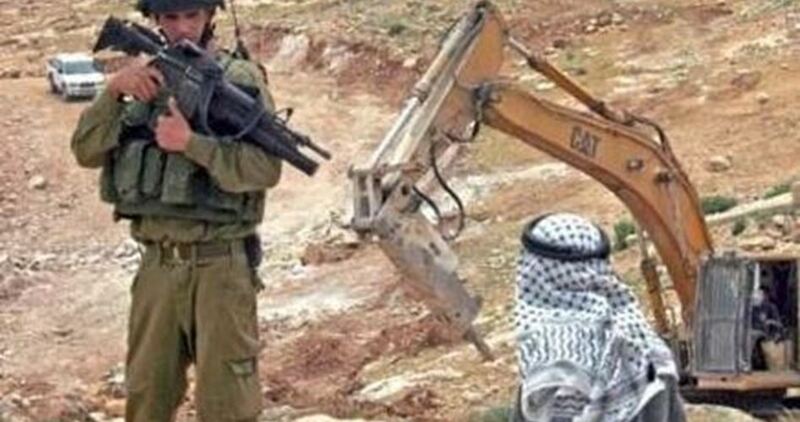 The Israeli occupation forces (IOF) on Saturday confiscated construction equipment in Masafer Yatta area, south of al-Khalil, and photographed homes and structures belonging to local residents. A local official reported that Israeli troops stormed Qawaqis area in Masafer Yatta, took photos of a tin shack belonging to a local resident and seized building items from one of the houses there. The Israeli army prevents the residents of Masfer Yatta from expanding their residential areas and repeatedly destroy their homes and structures. Mohammad Sabaaneh was released from an Israeli prison four years ago. He had been incarcerated for five months, spending almost two weeks in solitary confinement. Israeli forces held Mohammad in administrative detention, meaning they needed no charge and did not send him to trial. During one of his interrogation sessions, he managed to steal some paper and a pencil to begin sketching his ideas for images documenting his time in prison, smuggling them out with every prisoner who was released. When Mohammad himself was eventually released, he collected his sketches and completed the cartoons that make up his new book “Palestine in Black and White”. The first image he completed was of Gaza. Drawn in 2014, when Gaza was suffering under Israel’s “Operation Protective Edge” that led to the death of 2,251 Palestinians, including 547 children, it shows dozens of grotesque characters pointing rifles, tanks and missiles at a small child sitting atop a tiny piece of land, meant to represent the civilian population of Gaza targeted by Israeli bombardment. The USA looks on from a distance, his stars-and-stripes hat easily distinguishable from the soldiers’ helmets. On the right, Gulf leaders and the world look the other way, ignoring the plight of Gaza’s almost two million besieged inhabitants. “That’s why I started to improve my style and to try find something new, to start improving my characters, scenes and tools,” he adds. I was speaking with a friend and he told me that when we as artists use the olive tree as a Palestinian symbol, we drop our right to coastal cities like Haifa and Jaffa. There we have always grown orange trees, and so these are featured in my work as well. 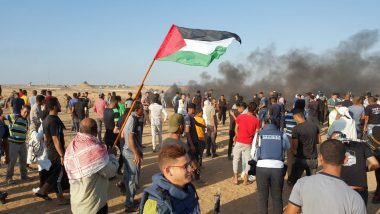 What’s happening here isn’t conflict – for conflict you could find compromise between the two sides – what is happening here is occupation, it’s black and white. It’s also settler colonisation, and that’s more difficult to understand because occupation is temporary, but they [the Israelis] want to stay here and expel the indigenous people and steal your identity, your tree. One such image that demonstrates Mohammad’s influences is the piece entitled “How will history judge the torment of Palestine”. A full page spread, the image shows famous historical characters like Edward Said, Malcolm X, Karl Marx, Mandela and Che Guevara looking on at the carnage of Israel-Palestine below. Israeli bulldozers are stopped in their tracks by a resolute Benazir Bhutto, as Fidel Castro tries to crush the vehicle from above. Martin Luther King stretches over Israel’s Separation Wall to tell a frightened Palestinian child “you have a dream”. While Ghandi stands proudly flying the Palestinian flag. To this end, Mohammad is already thinking about his next project. During our interview he showed me some of his latest images, including a table-length drawing of the history of women’s issues, from the moment Eve took the fateful apple from the biblical tree to the modern-day challenges facing women in a social media age. He explains, “in the past I didn’t do enough about women’s issues, so I’m redressing this now,” demonstrating a refreshingly self-aware approach to his evolving role as an artist. The US on Friday cut more than $200 million in aid to Palestine following a review initiated by President Donald Trump. “At the direction of President Trump, we have undertaken a review of US assistance to the Palestinian Authority and in the West Bank and Gaza to ensure these funds are spent in accordance with U.S. national interests and provide value to the US taxpayer,” the official said in a statement. Israeli Prime Minister Benjamin Netanyahu has told reporters accompanying him on his visit to Lithuania that he is seeking to divide the European Union’s front and try to prevent a consensus over Europe’s position on issues related to the Palestinians and Iran. In December, Lithuania helped Netanyahu to be hosted in the EU headquarters by inviting him to breakfast with European foreign ministers before their monthly meeting. The invitation was considered to be a ruse, as it ran counter to EU protocol and provoked anger in the office of the EU High Representative for Foreign Affairs and Security Policy, Federica Mogherini. Haaretz reported on Friday that after a systematic attempt to strengthen relations between Israel and countries ruled by extremist nationalist parties in Eastern and Central Europe — in order to sabotage the consensus required among the 28 EU member states for a unified policy — Netanyahu’s unveiled his strategy of using countries within the EU, such as the Visegrad states led by the extreme right-wing Hungarian Prime Minister Viktor Orban, to change the Union’s positions on the Palestinian issue and Iran. Netanyahu is taking advantage of Orban’s vote in international EU committees to, at the very least, prevent European consensus, thereby weakening the possibility of advancing international initiatives on these issues. Israel’s relations with Latvia and Lithuania have been strengthened in recent years, while Estonia has been trying to maintain neutrality in the Israel-Palestine conflict. Haaretz said that there is a brain drain in the Baltic States and this is an issue through which Israel seeks to boost its relations in the region. Netanyahu is also looking to exploit the concern in the Baltic and Eastern European states about Russia’s policy in the area, especially after the annexation of the Crimea. Israel sells those countries weapons and security expertise. When he said that there is “national pride” in Lithuania, “as there is in Israel,” Netanyahu was echoing the words of right-winger Orban. “I think that an important part of the excellent relations between Israel and Hungary is our relationship as nationalist leaders,” he said during a recent visit to Israel. Netanyahu plans to participate in the Balkan leaders’ summit due to be held in Croatia. Haaretz quoted EU observers as saying that Netanyahu’s approach hinders the possibility of Europe taking up unified positions. Israel’s moves in this respect have become intensive and aggressive in the past three years. “It is difficult for the EU to have one clear word about the Israeli-Palestinian conflict,” they point out. The newspaper added that Netanyahu’s policy in this context comes at a cost, not least because it is at the expense of major liberal countries in Western Europe. Netanyahu is effectively conspiring against these countries, including Germany and France, which are friendly to Israel, in order to prevent international consensus on the idea to which he pays lip service in his speeches to international and EU committees, namely the two-state solution. 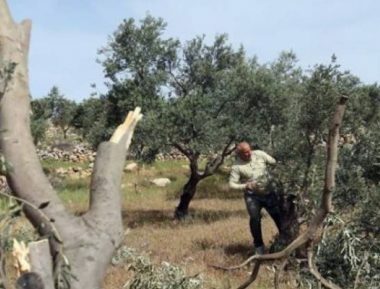 A number of illegal Israeli colonialist settlers invaded, Friday, a Palestinian olive orchard in the as-Sawiya village, south of the northern West Bank city of Nablus, and cut 30 olive trees. Ghassan Daghlas, a Palestinian Authority official in charge of monitoring Israel’s illegal colonialist activities, said the assailants cut thirty olive trees owned by Suleiman Hasan Ahmad. He added that the attack was part of dangerously escalating assaults by the illegal colonialist settlers against the Palestinians, their homes, lands and property, in several parts of the occupied West Bank. The official also said that the Israeli military does not investigate these violations, and even protects the assailants. On Friday evening, a number of colonialists hurled stones and empty bottles at Palestinian cars, driving on the Jenin- Nablus road, near Sielet ath-Thaher village, south of Nablus.